“Lisa, you need to calm down. In “The Shallows“, Blake Lively at least had a rock in the ocean on which she sat safely while a huge shark circled around her. That was frightening enough. In “47 Meters down” two helpless women are trapped in a steel cage while being attacked by such bloodthirsty white sharks. And there’s another problem they have to deal with. Oxygen deficiency. There are more pleasant ways to spend your holiday somewhere at an exotic destination. So you see it’s better to follow your instinct (or someone else’s) in such a way that you are spared from such life-threatening situations. My first thought: A movie filled with bubbles. At first, I feared this wouldn’t be such a very interesting film. A whole movie taking place in one and the same location (the bottom of the ocean) and with only two helpless young ladies who had no idea how to escape. “It won’t be more than some panicky scenes and a screen filled with anxiously produced air bubbles.” I thought. Well, just another proof that a person can be mistaken. Eventually, this movie was terribly exciting. You know how to dive? Yes! Ok, let’s go! Two sisters, Lisa (Mandy Moore) and Kate (Claire Holt), are on vacation in Mexico and after a night out with two local gigolo’s they are invited to descend into the ocean with the help of a shark cage. The only requirement is for them answering affirmatively to the following question: Are they experienced scuba divers? This already says a lot about the professionalism of this organization. As a down-to-earth, realistic person, I would draw a line there and turn my brown-bronzed back on this suspiciously smelling trip. But above all, I would never accept this offer, knowing that I’ve never inhaled a liter of oxygen under water. I would immediately get a panic attack. No problem for these ladies. Lisa has no experience at all, but her reliable sister knows how to convince her. If she dares to do this, she can prove to her ex-boyfriend that she isn’t so boring. So, Kate misses some sense of responsibility and Lisa a lot of brain cells. Or else the Tequila had something to do with it. It’s no fun down there. It isn’t necessary to elaborate more. You can predict what will happen. What else to expect when a not so professional-looking crew on a rickety boat lets you sink into the water while they use bloody bait to lure the sharks (which also turns out to be illegal)? Indeed, before they know it, they are building sandcastles on the bottom of the ocean and a nerve-racking race against time starts. The images themselves are impressive and realistic. The claustrophobic feeling overwhelms you. And the panic and fear of both divers (especially Lisa) are credible. Actual acting is of course not possible when you’re floating around at 47 meters below the water surface. The darkness and the thought of a full-blown “Jaws” attacking you from there, cause the necessary stress and frightening moments. Still a few points of criticism. Still a few points of criticism. Turns out that a single drop of blood from a wound is enough to attract such a gigantic shark. But when they suddenly try to attack out of the dark, they miss the helpless victim. I immediately conclude that such a shark must have a gigantic, well-developed olfactory organ. But besides that, such a shark is as blind as a mole. Furthermore, I found the computer animation of this predatory fish not quite successful. But I thought the same of the crumpled plastic shark in “The Shallows”. And the denouement is also something that you can discuss. And I doubt whether the event is scientifically correct. Next vacation abroad, I’ll stay by the swimming pool. But all in all, this was a pretty exciting underwater thriller, Cousteau would be happy to watch as well. 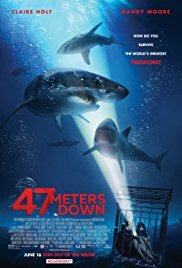 And apparently, there’s already a sequel in the making with the highest original title “48 Meters down“. So the problem will arise just a meter deeper. That’s what pushing boundaries means, I suppose! And for all of those who have plans for future distant journeys, a little advice. Stay safely by the swimming pool and do only excursions organized by the hotel. And get a proper travel insurance before you leave.